Easton’s 2016 Hybrid Z-Core from Easton is a heavier swinging two piece hybrid bat (composite handle and aluminum barrel). Our review consists of hitting it in the cage and on the field with a few different hitters. We aren’t the only ones to have information about the Hybrid Z-Core XL. Other places, in particular those who sell bats, usually have a boiler plate write up on the specs of a bat. Many of those we reference to make sure we are seeing what we should be. Here are some more references for the 2016 Easton Hybrid Z-Core XL review. The 2016 Easton Z-Core Hybrid XL (Price Check*) is made for players who prefer a big barreled and heavy swinging aluminum barrel bat that eliminates hand sting through a composite handle. While the DeMarini Voodoo has dominated this market for years, we’d recommend anyone seriously considering a performance bat in that niche to seriously consider Easton’s new iteration for 2016. DeMarini’s Voodoo Raw and Louisville Slugger’s 716 Select Select both stand out as comparable bats to the 2016 Easton Hybrid XL. All three bats are two piece hybrid bats with heavier swing weights. They also tend to be built for the heavy hitter and the collegiate player who prefers a bat with no break in period on the barrel. The three bats aren’t exactly the same, however. Easton boasts a larger barrel size than the other two while the Voodoo boasts a serious amount of technology in the connective piece to transfer max energy to the ball. The 716 comes in a slightly lighter swing weight than either. In the end, it’s hard to say you’d go wrong with either of those choices. Justbatreviews would prefer the Voodoo on what may simply be an “institutional knowledge bias”. Meaning, we simply have had a ton of experience with the Voodoo bat and this new iteration of Easton is, well, new. As well, the Hybrid XL only comes in a BBCOR version while the Voodoo and the 716 come in all types of sizes and models. That fact alone eliminates a significant amount of players. We have a week’s worth of cage hitting with the 2017 DeMarini Voodoo Insane. We’ve also exchanged emails with DeMarini discussing the upgrades and performance of this new bat. The 2016 Easton Z-Core Hybrid XL bat is a two piece baseball bat built with a composite handle and aluminum barrel. It is identical to the 2016 Easton Z-Core Hybrid (no XL) but with a heavier swing weight. The aluminum barrel, like the Z-Core bats from 2015 (S2z and S3z) have a composite sleeve inside which gives it the strength and durably to be severely over sized. This is a good thing. Like the 2015 Easton S2z and S3z, the Easton Z-Core Hybrid XL will use a spiraled carbon fiber handle design to decrease sting on mishits and add to a buttery soft swing and ping. We are not sure if this actually works, but we do find the two piece design on most bats does indeed remove hand sting. The swing weight of the bat measures as Easton’s heaviest performance bat in 2016. 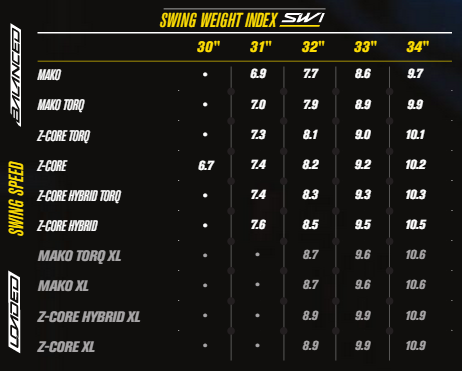 This makes it very similar to the swing weight of the 2016 Voodoo Raw from Demarini, about 5% heavier than it’s little brother Z-Core Hybrid and 13% heavier than the traditional Easton MAKO. The 2016 Easton Hybrid Z-Core XL will be available in BBCOR only. Standard 31, 32, 33 and 34 inch lengths with a drop 3 a .50 BBCOR stamp are all available. The bat will not be available in a Big Barrel, Youth Barrel or T-ball sizes. Those looking for a hybrid bat from Easton in those barrel sizes will need to look at the 2016 Easton S2.